I’m in charge of this lovely mint off-green crossover this week. So far, I’ve driven it from the office to my house and then again from my house back to the office. Only city miles up until this point for me, but I like it quite a bit. I can see everything out of it, I sit high up and I really like the way it looks, actually. It’s just very, very large. When did the RAV4 get so large? It’s a little hard to tell from this photo, but it’s actually got two-tone paint! Like on a Volvo XC40! The roof is white, which I think is very pretty. And I really love the interior, which has contrast orange stitching all over the place. We’re suckers for things like that, because it shows that someone in the great Toyota mothership cared about nice things. The gearbox is a bit dopey upon first impression, but I’m hoping that with more time behind the wheel, I’ll be able to feel it out more. This is the “Adventure” trim with all-wheel drive, which comes with a 2.5-liter four-cylinder engine and, as its name suggests, all-wheel drive. 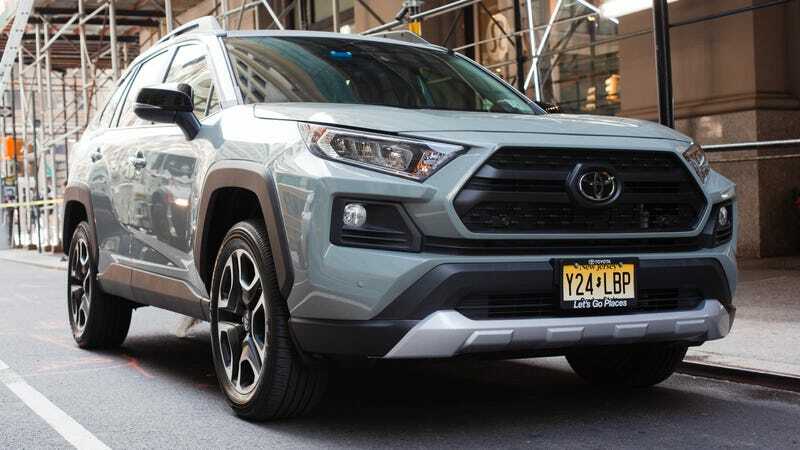 Toyota claims that it makes 203 horsepower and 184 lb-ft of torque, and the MSRP is $32,900, but with options like the Adventure Technology Package (clearance sonar, rear cross-traffic braking, which helps with your reversing-in-a-parking-lot adventures), a premium sound system and optional two-tone paint, the total comes to $39,634. That’s quiet expensive for a RAV4, which used to be just the little basic SUV. Anyway, what do you want to know about it? Ask away!